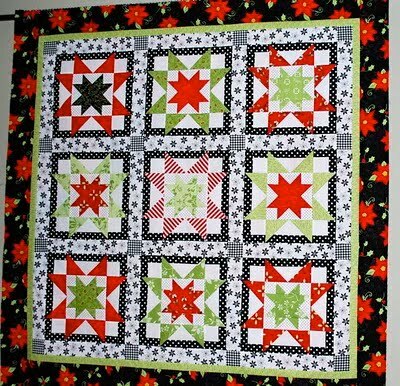 Cupcakes 'n Daisies: Thinking about quilting . . . .
Thelma, I love this pattern and I also love the fabric you have decided on for your's. But I'm thinking that this pattern could be done in any fabric, a complete line or just scrappy as all get out and still be an eye catcher. Why haven't I seen this pattern before??? These are the ones that generally reach out and grab me the moment I see them! Have a great day! Love the fabric! Definitely a sophisticated Christmas quilt. Half the fun of quilting is the planning! All those quilts that need to be made, enough for two lifetimes but we keep trying to squeeze them in and prioritize. Good luck! What fun! Planning, Planning! Love the pattern and I think your fabric is going to make an awesome quilt! I have now doubt that your version of this quilt is going to be beautiful. I love your fabric selections. It looks cute sitting there on your shelf! Yummers! I think that says it all LOL! Can't wait to see your version! I think it's going to be awesome! Great idea to 'get acquainted with your fabric first...love your choices!! Love the pattern and your fabric choices. It is going to be beautiful! It sounds like you're lucky enough to be able to shop at Hickory Stick on a regular basis? My friend & I drove up there (2+ hours one way) to do a little shopping. Loved it! I love Maywood Studio fabrics, and I don't think enough people know about them. They are beautiful, and feel so luxurious! Brilliant selection--both pattern and fabric! Isn't that design just wonderful? Can't wait to see how your version comes along. I'll be watching your progress; I like that pattern. What a perfect post title...when I'm not quilting I'm definitely thinking about it...sometimes I can't get to sleep because I have so much quilting on my mind! Great looking pattern! I love the star in a star look. wow, your shelves are so clean and organized. 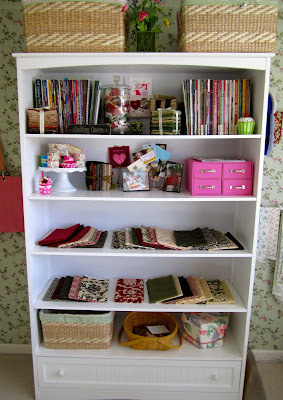 I was just setting up my new sewing shelves last night and they don't look nearly as neat as yours! That is beautiful fabric. Such pretty designs in it. I want to work on Christmas fabrics in December too and have been saving some Glace all year for a small cheery little quilt. its going to make a beautiful Christmas quilt! I look forward to watching your progress and seeing the quilt! ah yes a fellow eat, drink, sleep quilts type of person! seems we are always thinking about them aren't we? It's going to be beautiful! That fabric is so elegant! 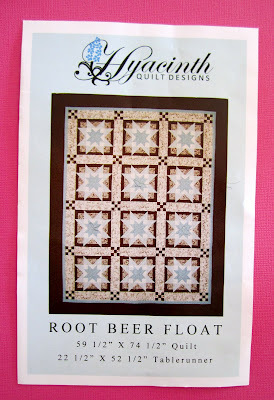 I went to Hickory Stick site, but I dont understand how to order the Root beer float pattern...Could you tell me what to do? Thelma, you are so right! 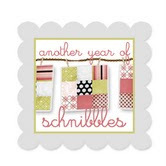 Even when I am not quilting, I am always thinking about quilting. 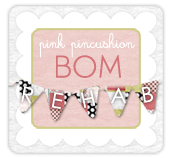 What to make next, what project to finish and now what should I talk about on my blog! Too funny and too true. Love that fabric and pattern too! Hi Thelma! 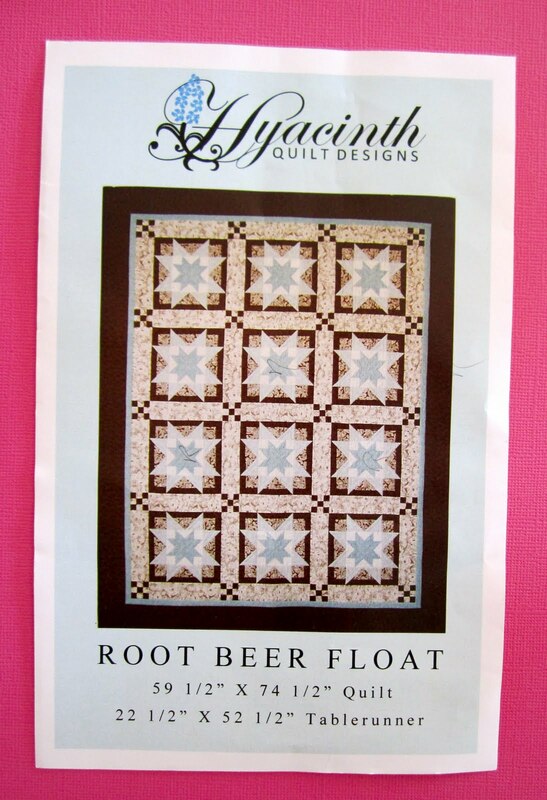 I just ordered the Root Beer Flaot from Hickory Stick Quilts, and they will mail it out tmr YAY! I'm thinking of doing a red, white N blue one for the summer since its stars, and I need a patriotic hanging...I'm sure I'll want to make it up in other fabs also. Love your choices. That will be one elegant quilt!